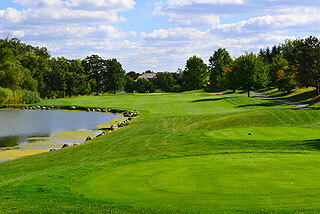 Ruffled Feathers is the shining jewel out of the Eagle Golf properties in the Metro Chicago area. Designed by Pete Dye (and his son), this 18-hole championship layout features a private country club atmosphere, including exceptional conditioning from tee to green, a wonderful practice facility, and top notch amenities in a modern clubhouse. The spacious pro shop is stocked with the latest in equipment, clothing and accessories. Equally accommodating is the Ruffled Feathers Grill, serving lunch, dinner and Sunday Brunch while providing an ideal atmosphere for an after round drink or snack. Banquet facilities can service from 12 to 250 guests, and up to 144 players can be accommodated in a variety of formats for golf outings. The golf course is well marked with yardage plates and sprinkler heads measured to the center of the greens. ProLink GPS is installed on all golf carts and provide accurage yardage measurement as well as pin placement information. The tee areas and fairways are sculpted on mostly level terrain, as the course winds through a beautiful residential community. These high end residences are far removed and do not intrude upon the course. Recognizable at Ruffled Feathers are the abundant water hazards traversing the property. Water comes into play on 7 holes on the front and all nine on the back. There are few forced carries however. Those playing from the tips (6808 yards/140 slope) will have some serious negotiating to do. The green tees play a challenging 6389 yards with a 134 slope, and the back tees provide a good days work with a 129 slope at 6015 yards. 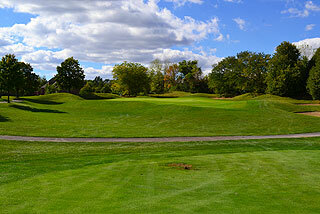 The "middle" and forward tees provide significant breaks from the hazards off the tee at 5273 and 4455 yards. Though challenging in nature, Ruffled Feathers provides golfers of all skill levels an opportunity to choose tees that will meet their capabilities. For the average golfer, we recommend the back tees. From these stations you will get the opportunity to use every club in your bag. The layout includes a great variety - holes where you can grip it and rip it, intermingled with those that require thoughtful shot selection and placement. The putting surfaces are quick but receptive, though quite a few are crowned or ridged. We appreciate courses that afford golfers the opportunity to get off to a good start. It is tough to get out of bed to be confronted with the number one handicap on the first hole. At Ruffled feathers, the first three holes feature two short par fours and a mid range par three ranked as the 11th, 13th and 15th handicaps. 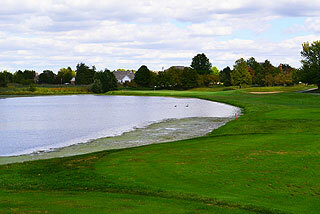 Be careful on two, as the water hazard cuts across the fairway about 80 yards out. The elevated green on three is tricky - land in the left bunker and you will be attempting a save towards the water. 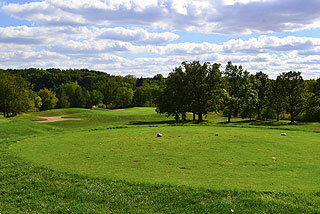 Along par five and equally challenging 4 par (467 from the tips, 414 from the back tees) follow. Water all along the right side and a long, narrow green provide the challenge on 4, and the approach to a perched green on five demands accuracy. Aim over the small tree in the left center of the fairway on the dogleg left par 5 6th- which has water along the left and bunkers scattered about the fairway. The par 4 seventh and par three 8th are quite score-able, and precede a tough closing hole - one of 3 par fours that measure over 460 yards from the tips. 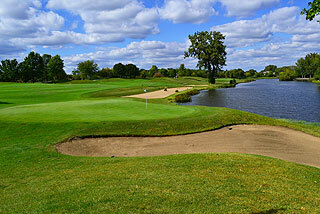 Water affects your approach to the green on the par four tenth and the island green eleventh. There is just 5 yards of grass between the greens and the water hazards. A lay up towards the 150 is recommended on 12, as attempts to cut this dogleg left may end up in the deep swales and mounds, leaving undesirable lies. 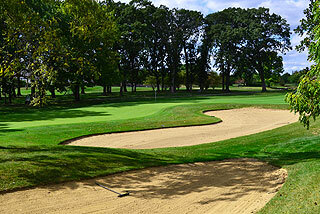 13 also bends to the left and is an easy hole to par if you can avoid the abundance of fairway bunkers. Long hitters may be able to drive the green on 14, and the 15th provides a classic risk/reward situation. With a long, well placed drive to the center of the fairway, one might be tempted to go for the green creating a possible eagle attempt. It is reachable in distance, but a mature tree along the right, and a formidable creek will create the need for an extremely accurate approach - though there is some room long. The safe play includes a lay up to a generous landing area, followed by a short iron or wedge shot over the hazard. The 16th provides the longest forced carry of the round - over a considerable marsh area with a pond to the right - another pretty golf hole. There is bail out room to the right on the long par three 17th, which is followed by a tough finishing hole. The 18th doglegs left with fairway bunkers right and a water hazard that juts out towards the fringe along the left from 60 yards in. 434 yards from the back tees, this is a formidable challenge. Great golf course! 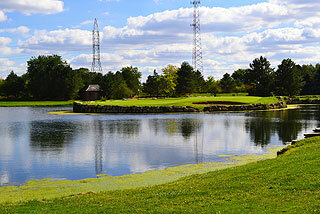 And easy to get to - just off Route 171 and south of the famous Cog Hill Golf Club. 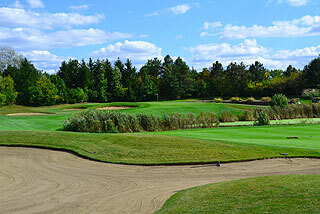 Upon opening, Ruffled Feathers was honored with a "Best New Course Award" by Golf Digest and Golfweek Magazine. Now settled and matured, Ruffled Feathers provides a true and fair test of golf with an outstanding group of par threes and a great variety of par fours and fives. Highly recommended! Click here for a link to our detailed information page for this course with a link to their website.